When it comes to changing looks of your phone screen, it is not just changing the wallpaper anymore. Android has custom launchers, which allows developers to create really cool home screen, icons, transitions and other neat designs for a phone's front end. When you are with Android, you must know that there exist many custom launchers. Using them you can practically renew your phone's look every time you require a change. One must note that, even though many manufacturers produce Android devices, they still manage to produce one that has a fairly unique OS feel. Custom launches have their part in this. Companies like Samsung, Xiaomi etc. all have their own version of Android with their own looks. A lot of Android users argue that the default Android launcher that comes with stock Android is the best. But, change is what we want sometimes. When you want to change, go with something popular and something nice. One of such best and popular launcher is called GO Launcher EX. This launcher is not unknown to many and has some really neat features and looks. Best of it all, it comes for free. Home Screen is the first screen that is displayed after the phone is unlocked. It is like a desktop for phones. It contains all the useful icons and widgets for easy access. With GO Launcher EX, you get a completely new home screen design. Its details are really configurable. There are five home screens by default, but you can increase as well as decrease the number. Out of the available home screens, you can also choose which one to make the default. You won't always have to make the one in the middle as the default one. You can also drag the positions of several home screens. That one in the center can be moved to the right and so on. There are some really beautiful widgets and apps that you can add to the home screen. Apps details can be configured, like changing their names or icons. 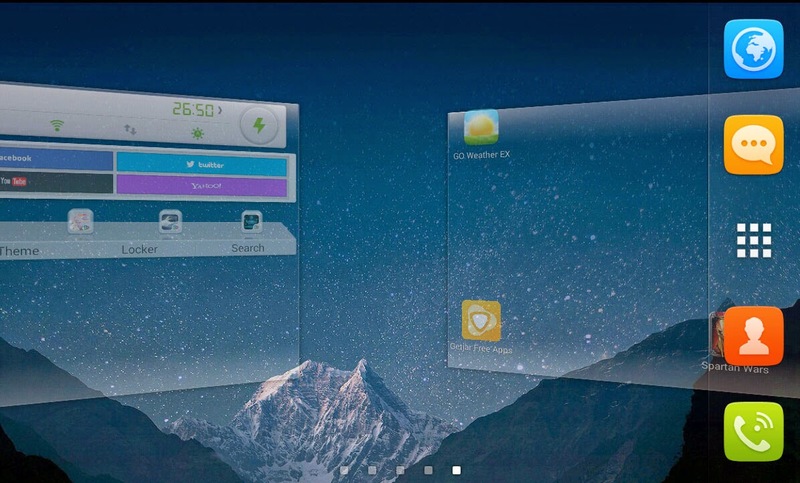 There is also a home screen locking feature which stops accidental moving and editing of home screen apps and widgets. App drawer is the place where all your installed apps are listed. The app drawer also has received a fresh new look with new icons. You can configure those highly just like on the home screen. 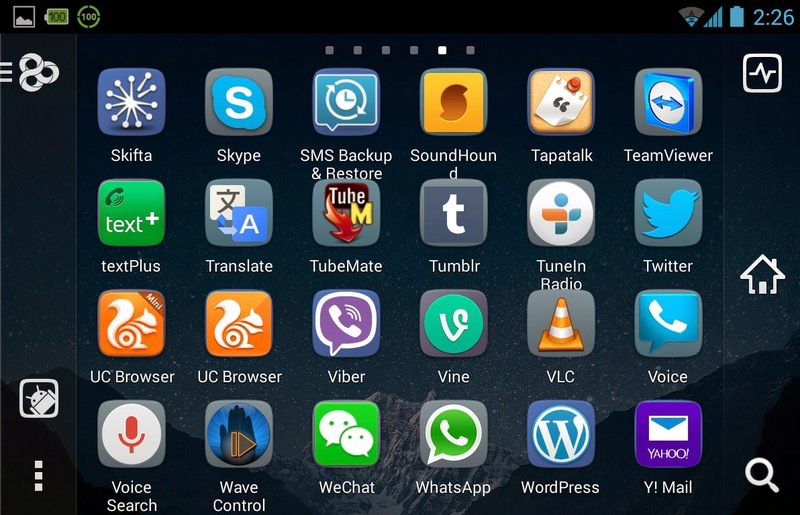 The listing of the apps on this can be configured to display apps alphabetically, by their install date or by their use frequency. You can also create folders at this location to group apps. One interesting feature about App Drawer and folders is the ability to create auto folders which tries to auto group the apps by their category. This way, your home screen won't have a lot of pages. Instead, apps will be categorized and placed into folders. You can, of course, edit this auto categorization. Other cool features of the app drawer are that it displays apps that are currently running and recent apps. Background apps can be shutdown with the app drawer itself. Other app related feature is that apps can be launched using gestures. The people who worked hard to bring this awesome launcher to us did not compromise on anything including visual effects. Visual effects can prove how advanced our handheld devices are these days. This launcher has some really smooth transitions. When switching from one page to another, apps are flown in using several effects. You have transition effects like Glass, Gradual, Crystal, Curve and many more on the list. Transitions animations are both 3D as well as 2D. A new 3D core transition engine is currently being tested in beta and it is a huge leap in improvements. Transition settings like speed, timings etc. are all there. You can configure these for the home screen as well as the app drawer. Besides smooth transition, you have to understand that the home screen as well as the app drawer can be both aligned in portrait as well as landscape. This launcher has a large set of background and wallpaper collections. You can easily download them. The default one is not bad but if you want to change, you have options of downloading several live wallpapers. The wallpaper gallery is awesome. Themes are there which require installation but then they change everything around. Looks are refreshed with themes. Be sure to check out the themes of the week to get ideas on which theme to download. There are themes for every occasion and moods. There are some neat ones based on Thanks Giving, cooking themes, girly themes, etc. 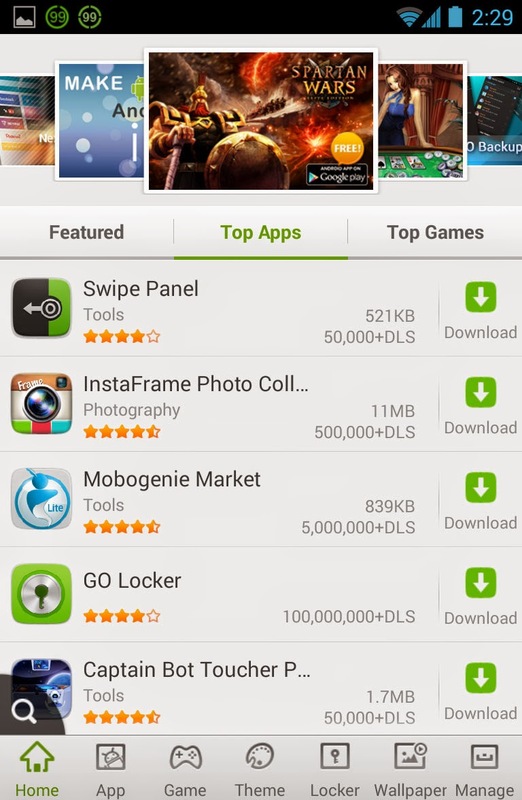 GO Market: An Android app listing store, which displays some really interesting apps and games. Click on those apps and you will be linked to their Play Store page. This alternative market can sort the apps by their categories like: apps, games, themes, locker and wallpapers. It also displays apps which require an update on a separate tab. 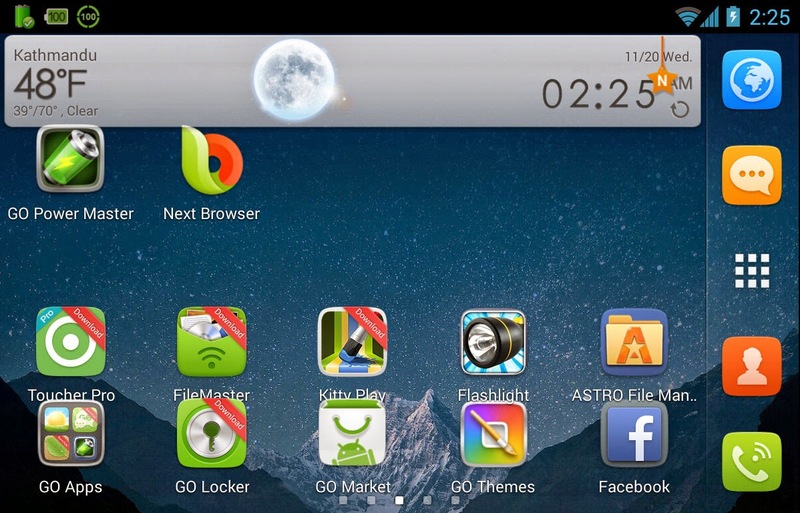 Languages: GO Launcher EX is not just limited to English users. Language packs can be downloaded for several other languages so that users can use them in their native language. Backup and Restore: Backup all the edits and settings that you change in GO Launcher EX. This way you can import it to other devices or even the current device if you are resetting it. Copy Home Screen: You can copy the home screen from your previous launcher. This will save you a lot of time in configuring. Gestures: Configure and use gestures for launching apps and settings. This is a quick and innovative way to launch your favorite apps. Setting Screen: Android has a built-in, all in one setting screen. Well this app has one too. From there you can view all the settings in one page. Turn on and off your Wi-Fi, Bluetooth, and GPS etc. from this single settings page. Other settings include display, sound, language, application, security, network, storage, battery, data usage and tether settings. GO Backup: It's not Titanium back up but you can back up and restore app data and system settings. GO Weather Forecast and Widgets: Advanced weather widget and app. This app has features such as forecasting weather for the future. The widget displays a nice clock at the home screen. 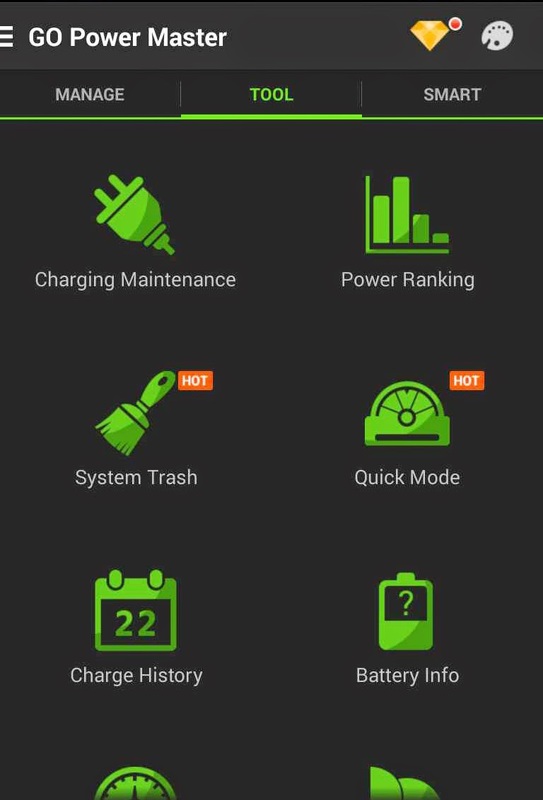 GO Battery Saver and Power Widget: It is a really powerful battery saving app that comes with a widget. This app includes different battery save modes. It also displays time that you can save using particular settings. This app automatically appears on the Android notification bar for quick battery saving controls like turning off the GPS. Next Browser for Android: A nice browser with a widget that includes shortcuts and bookmarks to your favorite websites. This is chrome like browser that requires sliding gestures for tab switching and browser extensions use. Extensions include screenshot taker and night mode. Download additional extensions like Evernote and Pocket. GO Locker: This is a popular and awesome locker. Lock screen supports widgets like SMS access, call logs, music player etc. GO SMS Pro: A SMS app to replace the default one. With this SMS can be sent with emoticons. You can also schedule messages, turn on auto reply. There are so many features with this SMS handling app. GO Switch Widget: A simple but powerful widget. Turn on and off services like Wi-Fi, GPS, and Bluetooth etc. GO Launcher EX Prime: This is a paid version of GO Launcher EX which actually unlocks some locked features. It is normally $5.99 to buy. This unlocked version introduces additional transition effects and gestures. GO Launcher EX itself it totally amazing. Upgrade to Prime if you really love this app, want to support it and are looking for some added features.